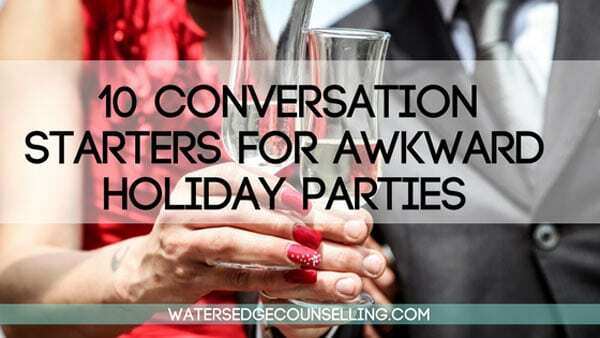 December is prime time for awkward conversations. There are work break ups, and family reunions, catch-ups with friends and community gatherings—all which require a certain amount of social prowess. As someone with social anxiety, these events exhaust me. Having to navigate awkward questions about my relationship status and side step political banter means I don’t have a lot to give when it comes to starting conversations. Come January 1, lots of us feel this way. So to help you along the way, we’ve come up with 10 great conversation starters for you. Pull one out next time you’re standing next to an introvert or when your second cousin once removed is seated next to you on Christmas Day. All going well, this will create a conversation deep enough to go beyond weather talk, but light enough to avoid the unmentionables—politics, religion and having kids. This is a fail-safe way to find out about a person’s general interests. Maybe they’ve just started Cross Fit, are taking the kids to basketball practice, or belong to a religious community. You may even have something in common! This general open-ended question gives the other person permission to talk about whatever they want—holidays, new goals in the work place, their hope to start a family, or their plans to travel. Short of having someone say, “I’m not really a movie person,” this is bound to start a conversation about the definitive ranking of Star Wars movies, great rom-coms, historical masterpieces or your favourite superhero. Because who DOESN’T want to talk about their fur babies, and want to show strangers the collection of adorable photos they have of them on their phone? Obviously this is only useful if you’re speaking to a parent, but children are a great talking point—especially if you’re a relative. You’ll hear about their school work, their extra curricular activities, their health and their favourite TV show. Some parents will be more comfortable talking about their kids than themselves! Did you see [insert name of TV show/movie here]? If you’re talking to someone in a similar age bracket, there’s a good chance they at least know about the TV shows and movies you’re into. If not, choose a generic movie or TV event few people miss—like Carols in the Domain, the New Years Countdown or a long-awaited miniseries about an iconic person. The perfect question for avid readers or Netflix fans—this gives people the opportunity to talk about what they love and why. You’re giving them an outlet for their obsession. Trust me, they love it. Find a hilarious video on Facebook and share it with your long-suffering compatriot. Animal videos are always worthwhile, although you can find some holiday-themed gems as well. What surprised you about this year? This is an out of the box question that is sure to get the wheels turning in their head. While they’re considering their answer, come up with your own. This will lengthen the conversation and give you a chance to really get to know someone else. Do you feel anxiety around the holiday season? Would you like support as you navigate difficult relationships or awkward conversations? Here’s what you need to do: contact Colleen on 0434 337 245 or Duncan on 0434 331 243 for a FREE 10-minute phone consultation on how we can best help you, or press book now to book on our online diary.